Golgi impregnation stain showing reduced complexity of pyramidal neurons in 10-day old mouse hippocampus (CA1 region) following in utero exposure to vehicle (Veh) or the dexamethasone (Dex). The life threatening, emotional and economic burdens of premature birth (~12% of pregnancies) have been greatly alleviated by antenatal treatment with synthetic glucocorticoids (sGCs). Antenatal sGCs accelerate tissue development reducing respiratory distress syndrome and intraventricular hemorrhage in premature infants, but they can affect developmental processes in the brain and trigger adverse behavioral and metabolic outcomes later in life. While the well-established beneficial neonatal outcomes of antenatal GCs support their continued use, we are utilizing mechanistic analysis of novel GC pathways in the developing brain (particularly in the hypothalamus and cerebral cortex) to identify new biomarkers and drug targets for male and/or female fetuses at high risk for adverse, neurological outcomes of GCs or resistant to their beneficial effects on the developing cerebral vasculature. 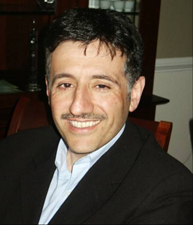 Our approach includes molecular studies, genome wide assessment of sGC target genes, behavioral analyses in mice and histological analysis in knock-in mouse models as well as primary human neural stem cell cultures. Of direct clinical relevance are our proposed studies with cells derived from human fetuses that were exposed to antenatal GCs, which could identify novel real time biomarkers that predict outcome in children exposed to sGCs in utero. 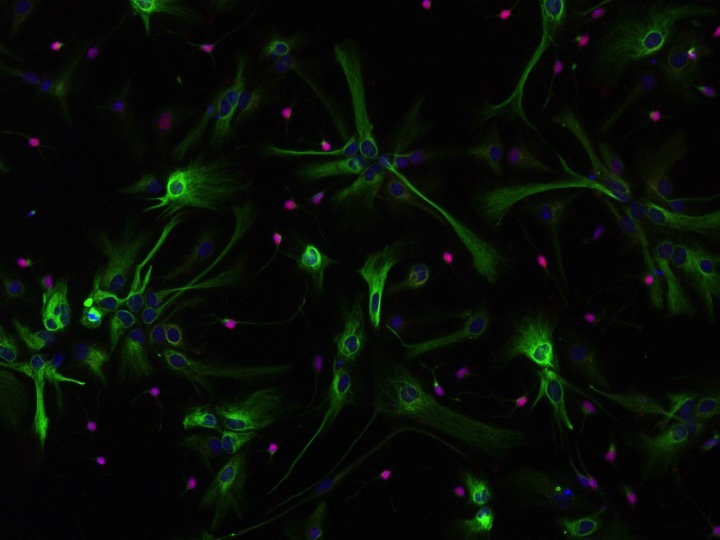 Indirect immunofluorescence staining of murine embryonic neural stem cell cultures differentiated in vitro to visualize the stem cell marker nestin (green), the oligodendrocyte progenitor marker Olig2 (pink) and nuclei (DAPI in blue). Biological effects of GCs are mediated by the glucocorticoid receptor (GR), a member of the nuclear receptor super-family of transcription factors. While primarily studied for its role in the nucleus, GR is also localized in the plasma membrane where it can rapidly mobilize a variety of cytoplasmic signaling pathways. We have identified unique genomic (i.e. nuclear) and nongenomic (i.e. cytoplasmic) GR signaling pathways that are activated in response to antenatal GCs in the developing brain and cultured embryonic neural stem cells. For example, novel gender specific molecular targets of the genomic GR pathway are being identified by genome-wide RNA-Seq and ChiP-Seq approaches while work continues to investigate the biological impact of nongenomic GC effects on gap junction communication and synchronous, spontaneous Ca2+ transients in coupled neural stem cells. Furthermore, we continue to explore the impact of crosstalk between nongenomic and genomic GC pathways, which we have found to regulate site-specific GR phosphorylation and recruitment of the receptor to distinct subsets of target genes. Prostatic inflammation is a common feature of symptomatic benign prostatic hyperplasia (BPH) and may alter epithelial cell proliferation and tissue homeostasis in BPH through cytokine induction of proinflammatory signaling mediators such as cyclooxygenase-2 (Cox-2). Current therapies for symptomatic benign prostatic hyperplasia (BPH), an androgen receptor (AR) driven, inflammatory disorder affecting elderly men, include 5α-reductase (5AR) inhibitors (i.e. dutasteride and finasteride) to block the conversion of testosterone to the more potent AR ligand dihydrotestosterone (DHT). Since DHT is the precursor for estrogen receptor β (ERβ) ligands, 5AR inhibitors could potentially limit ERβ activation, which maintains prostate tissue homeostasis. We have uncovered signaling pathways in BPH-derived prostate epithelial cells (BPH-1) that are influenced by 5AR inhibition. The induction of apoptosis and repression of the cell-adhesion protein E-cadherin by the 5AR inhibitor, dutasteride, requires both ERβ and Transforming growth factor-beta (TGF-β). Dutasteride also induces COX-2 expression, which functions in a negative-feedback loop in TGFβ and ERβ signaling pathways as evidenced by the potentiation of apoptosis induced by dutasteride or finasteride upon pharmacological inhibition or ablation of COX-2. Concurrently, COX-2 positively impacts ERβ action through its effect on the expression of a number of steroidogenic enzymes in the ERβ-ligand metabolic pathway. Therefore, effective combination pharmacotherapies, which have included non-steroidal anti-inflammatory drugs, must take into account biochemical pathways affected by 5AR inhibition and opposing effects of COX-2 on the tissue protective action of ERβ. 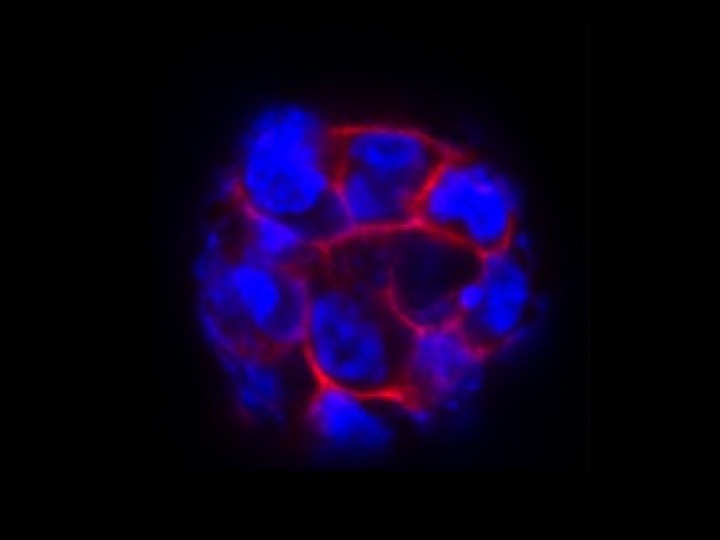 Indirect immunofluorescence staining of E-cadherin (red) in 3-dimensional cultures of human prostate epithelial cells (DAPI visualized nuclei in blue). Our laboratory seeks to identify novel gene signatures that can be utilized as biomarkers for symptomatic BPH patients to predict response to NSAIDs or to direct therapeutic development towards a drugable target in BPH, ERß. We utilize 3D cultures of human prostate epithelial cells (PrECs) to provide mechanistic insights into the putative loss of epithelial integrity in BPH. Finally, the novel, unique genetic changes (i.e. gene signatures) associated with inflammatory mediators (i.e. Cox-2) or responsive to NSAIDs in cultured human PrECs are being assessed in patient samples, including from a clinical trial that utilizes combined 5AR and NSAID treatment. Thus, these studies will directly test the utility of identified gene signatures for predicting BPH patient responses to NSAIDs and stimulate the development of new drugs that target ERß and/or enhance the therapeutic efficacy of NSAIDs. Leach DA, Need EF, Toivanen R, Trotta AP, Palenthorpe HM, Tamblyn DJ, Kopsaftis T, England GM, Smith E, Drew PA, Pinnock CB, Lee P, Holst J, Risbridger GP, Chopra S, DeFranco DB, Taylor RA and Buchanan G. Stromal androgen receptor regulates the composition of the microenvironment to influence prostate cancer outcome. Oncotarget 6:16135-16150, 2015. Solomon JD, Heitzer MD, Liu TT, Beumer JH, Parise RA, Normolle DP, Leach DA, Buchanan G and DeFranco DB. VDR activity is differentially affected by Hic-5 in prostate cancer and stromal cells. Mol Cancer Res 12:1166-1180, 2014. Peffer ME, Chandran UR, Luthra S, Volonte D, Galbiati F, Garabedian MJ, Monaghan AP and DeFranco DB. Caveolin-1 regulates genomic action of the glucocorticoid receptor in neural stem cells. Mol Cell Biol 34:2611-2623, 2014. Indyk JA, Candido-Vitto C, Wolf IM, Venkataraman S, Munoz R, Saladino RA, Witchel SF and DeFranco DB. Reduced glucocorticoid receptor protein expression in children with critical illness. Horm Res Paediatr 79:169-178, 2013. Samarasinghe RA, Di Maio R, Volonte D, Galbiati F, Lewis M, Romero G and DeFranco DB. Nongenomic glucocorticoid receptor action regulates gap junction intercellular communication and neural progenitor cell proliferation. Proc Natl Acad Sci USA 108:16657-16662, 2011.